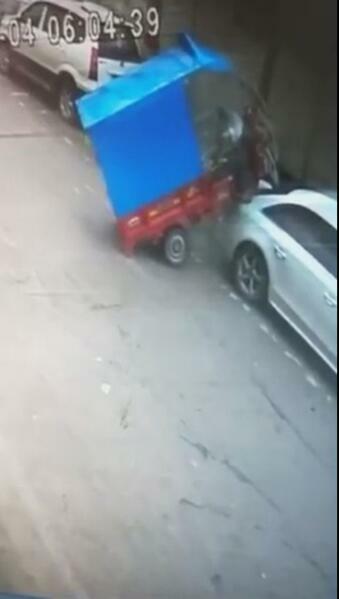 A pedicab rider was left stunned with his ' possessed ' vehicle did a sudden wheelie and mounted the back of a parked car. The rider seemed to have no control of his pedicab in CCTV footage of the bizarre incident. The accident happened in China and the woman who owns the white sedan is now negotiating with the pedicab rider over possible compensation. It was difficult for her to believe that the pedicab rider did not intentionally crash into her or that the accident was least down to his negligence. The 10-second clip now being widely shared online as the "possessed pedicab" and viewed more than three million times at the time of writing shows the vehicle travelling straight before suddenly bouncing up in the air. The out-of-control pedicab veers to the lift and ends up "riding" the boot of the parked car, leaving the driver stuck in the awkward position after the unexpected crash. The man later gets off to inspect the damage, and he waited for the owner of the car to appear before trying to explain his innocence. In spite of the unusual circumstances, investigators are still expected to charge the pedicab rider with full responsibility for the crash.